Home Politics Remarks at PDP NEC Meeting By His Excellency Atiku Abubakar GCON, At the PDP Headquarters, Abuja. 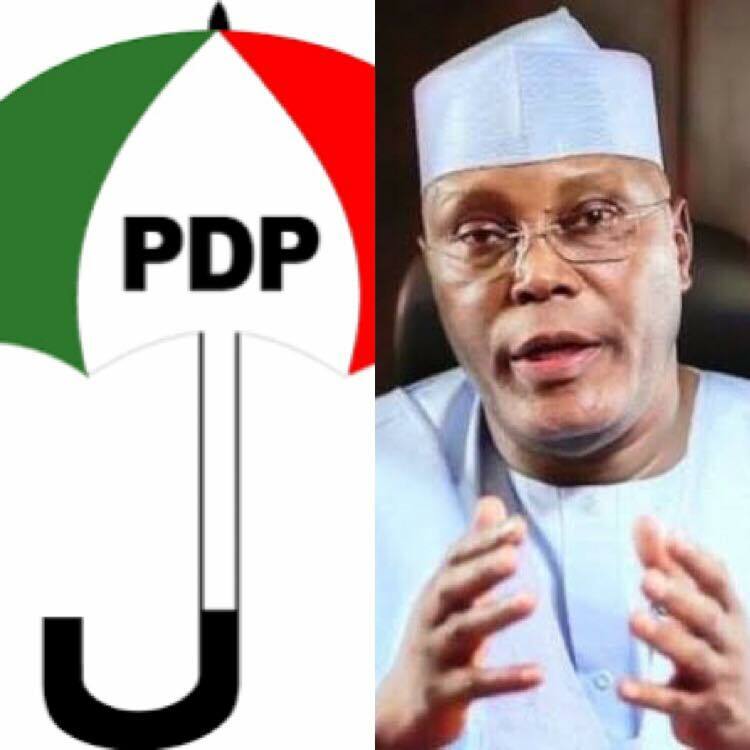 Remarks at PDP NEC Meeting By His Excellency Atiku Abubakar GCON, At the PDP Headquarters, Abuja. I find it necessary to, firstly, pay tribute to every member of our great party, and our long-suffering people who directly bear the costs of the cancellation of the first phase of our general elections that was to commence on February 16th, 2019. I am sure we can all relate to the losses and burden on our citizens who travelled to various destinations for the exercise. This is in addition to the burden on election personnel willing to sacrifice in furtherance of our democracy. Inadequately prepared and yet deployed to hostile centers, these personnel, like us all, have also become victims of the potentially destructive path upon which our country has been thrust. Nevertheless, together we stand poised on the edge of victory, but we must not let down our guard or lessen our resolve as we have an opponent who will stop at nothing to retain power. Our goal is not to gain power for our own sake, but for the people of our country who have been so hard hit by four years of APC cluelessness and incompetence. Four years which have seen 14 million more of our people without jobs, more of our people killed than ever before and more of our people living in extreme poverty than any other nation on this planet. Let us not forget that in the last three years of the last PDP, administration Nigeria had become the largest economy in Africa and in each of those years, we had the fastest growth rate in our continent. And so true to our values and commitment to chart a new path for our beloved country, our campaigns have been issues based, offering Nigerians hope for a better tomorrow; while demanding free, fair, transparent and credible elections from the government. The feedback from our supporters throughout the country confirmed their desire and willingness to entrust their destiny to us as a viable alternative to their hopelessness. However, it now appears that our participatory democracy which we have enjoyed for 20 years, which empowers our citizens to decide who leads them, is under threat. This is worrisome, considering the great sacrifices including the ultimate sacrifice made by many to uphold the tenets of democracy in our country. Today, I call on President Buhari, to make that same commitment to the people whose mandate he holds, while also urging all security agencies to uphold our constitution with an understanding that voting is a civil activity and civic responsibility. The Nigerian military is constitutionally responsible for protecting our national integrity and its borders and has no role to play in the conduct of elections. Additionally, I call on the Independent National Electoral Commission (INEC), once again to remain impartial arbiters while ensuring that they conduct credible elections, this time around. INEC must ensure that all logistical challenges are addressed between now and Saturday, the 23rd, and that all materials retrieved from the field are inspected by participating political parties before the commencement of the elections. My fellow Nigerians and party men and women, I am certain that you have also keenly followed with interest, utterances from the leadership of the All Progressive Congress (APC) and Gen. Buhari, which is a painful reminder of the era of dictatorship and military rule. Gen Buhari has repeatedly violated the constitution and failed to uphold the rule of law, recent instances include the unconstitutional suspension of the Chief Justice of Nigeria, the day before he was to appoint the judges for the electoral tribunals that will decide any appeals of whether any of our elections were subject to manipulation. Thereby crossing the immutable line that divides the Executive from the Judiciary. It is quite shocking for any head of state to utter such words in a democracy. A pre-condition for ‘free, fair and credible’ elections is that the people are able to cast their vote without fear of violence. Elected into office by the votes of the people in what is considered Nigeria’s most free, fair and credible election, you owe it to our people to let them give their verdict in the same way you were elected. If you do, history will commend you for it. If you don’t history will condemn you for it. We must now turn our attention to the upcoming elections this Saturday, where the destiny of our people and country will resoundingly be decided. In spite of last week's disappointment, I urge all Nigerians to come out and vote for the candidate of their choice, keeping in mind our desire to build a democratic and economically viable nation that will be respected amongst the league of democratic nations. So, let me reassure you my friends: we are going to win these elections. And to our long-suffering citizens, I say do not despair, our time is now, and together we shall reshape the destiny of our beloved country. Together we can make Nigeria work again.